I grew up in a big, old house in a very small town. With a cranberry bog on one side, a forest on the other, a swamp to the rear and a cemetery across the street, we had all of the makings of spooky stories, creatively crafted by an abundance of older siblings (nine to be exact), many of whom were eager to scare. Yes, I grew up afraid of things. Bats were no exception. In addition to all of the creepy falsehoods that I had learned about bats from movies and books, there were the tales woven by my older siblings: how bats attack at dark and drain one’s blood before retreating to the cemetery across the street and how they love hair … just about the scariest thing you could say to a little girl with hair the likes of Diana Ross on the head of a small seven or eight year old. My hair in an untamed, unbraided state was perfect terrain for a bat on the run. So, when word spread that a bat was in our house and was flapping about in an upstairs rear bedroom, I was petrified. With the long, thick, and wiry head of hair that grew upon my head, I was the perfect target if what my siblings said about bats loving hair was true. I don’t quite recall how the whole thing unwound … there were sheets and towels being cast about the house in an attempted to capture the bat and send it back into the wild. However it played out, it didn’t warm me up to bats at all. Fast forward a few decades, to the Bat Festival at Gulf Branch Nature Center on August 18th, where two of my kids and I were the first to arrive at the eagerly anticipated event. I’m very pleased to say that since my childhood days, I have out grown most of my fears, mostly through education and as the result of becoming a parent, which inspired me to become a naturalist. I have learned a bit about bats over the years and now understand how important they are to the pollination process and for insect control, since insect-eating bats are major predators of night flying insects, many of which are plant pests and have a detrimental impact on our crops. I also understand that bats are under great threat from white nose syndrome, a fungal infection, that, according to the Save Lucy the Bat campaign, threatens half of North America’s 45 bat species and that has killed almost 6 million bats of six species since 2006. The figures today are far more staggering. Visit Save Lucy the Bat to learn more. My 5-year-old son and 8-year-old daughter were perched up front during the bat talk which was well-presented for both kids and adults by Leslie Sturges, Director of ‘Save Lucy, A Little Brown Bat.’ The room was packed and the energy at the front of the room, where the little people swept across the front row and floor, was quite high. The audience was excited and engaged with some knowledgeable youngsters eager to impart what they knew about these little fuzzy and often misunderstood creatures. – saw a live bat and listened to its amplified call. 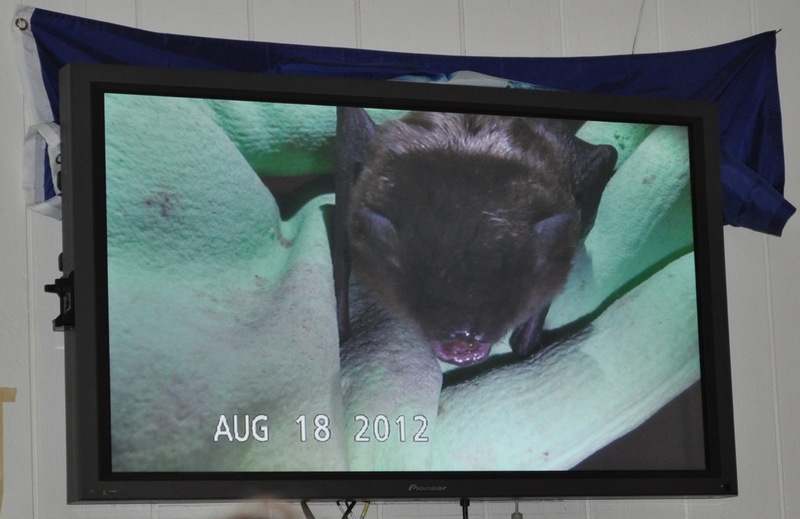 The talk was followed by a naturalist-lead bat walk, during which children were asked to find bat cutouts hidden in places where bats might typically be found (behind shutters, in overhangs, trees, etc.) Since the sky was still light during our walk, we didn’t encounter any bats along the way, but we learned more about their habitats and habits. After a stroll through the nature center, where we learned about studies being done to learn more about bats and watched amazing videos of bats hunting, swimming, and even appearing to run! Then we headed outside to have some silly fun playing bat bingo and spinning the wheel to earn points based on our bat knowledge. I also had fun connecting with fellow naturalists I had met and trained with over the past year. As the sky continued to darken, the time had come for us to depart, though the kids weren’t quite ready to leave. But, as we looked up to the tree tops and saw two bats in pursuit, we felt our evening was complete and headed home. Learn more about bats and why they are endanger, and how you can help. Visit Save Lucy the Bat. Have a bat story to share? Please tell us about it in the comments section. This entry was posted in Gulf Branch Nature Center by armneditor. Bookmark the permalink.